I love travel journals, my bedside drawer is full of them documenting my journeys. Often I will look back at them and reminisce about the good old days and it is surprising how much you actually forget. I am grateful that I wrote every day while I was backpacking around the world as now I have these precious journals to transport me back to my travelling days. The first travel journal I kept was in the late 80’s when I went to Darwin. The excitement of my first plane ride and exploring new sites. Back then children could go into the cockpit to see the view out the window, the pilot also gave us a run down on the switches and what they were used for. Sadly now times have changed with terrorism and our children will not get these opportunities. It is interesting looking back at my Ansett boarding pass as the airline is no longer around. There is also a packet of pepper with the Ansett logo in my diary, I wonder if that will be worth some money one day! We dined at Holtze Cottage Botanical Gardens and being a young girl from the bush I was blown away that they pull out the chairs for you and put the napkin on your lap. I was not used to this five star treatment that you only see in the movies! I remember thinking how expensive our dinner was and looking at the bill a porterhouse steak was $16 which seems cheap now days. I love that I can be transported back to my 11 year old self and look at how I saw the world back then. A happy time filled with wonderful family memories. After finding my old travel diaries from when I was a child I have decided that I want my children to do the same thing. We are often out camping and exploring and I want them to document our adventures so they have long lasting memories. 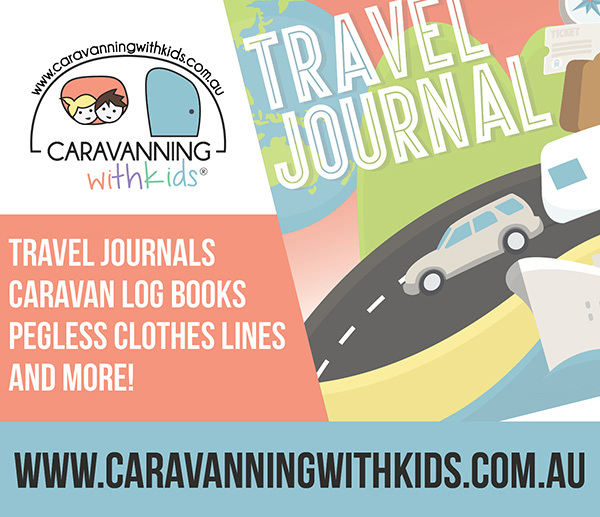 I have been trying to find a good travel journal that suits their age and I was excited to discover Caravanning with Kids Travel Journal. If you are heading off on a trip with your kids why not pick up this travel journal from Caravanning with Kids so you have a gorgeous journal to look back on in years to come. Get your kids writing and keeping a journal as they will love you for it in years to come. I love travel journals too. It’s such a wonderful way to keep our memories and special trips alive. I have a diary from when I was 14 and went to Italy for the first time with my parents, lots of fun to look back on. The travel journal here for kids looks wonderful. Great post Anne. Wow you went to Italy with your family! We usually just went to the coast for a week. It is funny the things that excite you when you are a child! This is such a great idea! We do a lot of adventuring and this is a great way for our kids to remember and look back on our travels. I am sure your kids will love the journals! I love this idea Anne. I’ve never had a travel journal but think I will start now. That meant you need to go on a holiday now so you can write in your journal! I love travel journals too. I used to travel journal when I was young in a regular notebook but this looks much more fun! How good is it looking back at your old journals? Love this (I still have my old journals too) – these look like a lovely way of storing memories!! It is good fun looking back at your old journals, brings back so many memories. What great memories you have captured in your journals. Love the Ansett boarding pass & pepper. My husband worked for Ansett so we have a large blue umbrella with the logo emblazoned across it and a few other bits and pieces. I wonder am I sitting on a gold mine? Lol. Probably not. I wish we were both sitting on a gold mine, how nice would that be!! I kept travel journals as a kid too and I’m so glad I did. I’m a bit of a hoarder though and also keep every ticket stub, boarding pass, foreign money… you name it. Definitely hang onto that pepper could be worth something none day for sure!! I might go and try and sell the pepper on ebay now!! I love this! We’re taking the kids on a 3 month caravan road trip next year and I’ve already started thinking about how to entertain them…. and I definitely want to encourage them to record their experiences. I know my little one (6) will love it. What do you think about 9 and 10 year old boys though… is it too young for them? How exciting a 3 month trip! I think the journals would be suitable as a majority of the book is for writing in and they can add photos or memorabilia from there trip. I have two daughter and find my self just looking after my both the kids rather than doing sightseeing. But some time it feels good to be with all member of family. It is always risk to travel longer distance. I never traveled more than 50 miles with my kids as they are just 1 yr and 3 yrs. Do you have any suggestion how to deal with this situation? I find that you need to slow things down and not try and see everything in one day. I might do some sight seeing in the morning and then have a fun relaxing afternoon. I often travel in the middle of the day so that the little one will sleep in the car. It is a difficult balancing act to keep the whole family happy but definitely achievable. What a fabulous idea. My kids aren’t quite at the age for journalling but I know in a year or so they would really get involved with it! Yes I am sure they will love it once they are old enough.